Pros: Rapid inflation thanks to included pump, quick to deflate, very portable once deflated, easy to keep clean, very strong. Cons: Some problems reported with the valve, does not fully contain a child and so not suitable for babies, inflation pump requires electrical outlet. The AeroBed Mattress for Kids is a great choice for people who need a very portable toddler travel bed. With an included electric pump and a fast deflation action this travel bed is quick to set up and pack away. Families who value portability and safety in a toddler travel bed. As an inflatable travel bed, the AreoBed for kids packs up into a very small package and is very light as well. With 4in roll guards surrounding the mattress and its low height there is no safety issues to worry about. For inflatable toddler travel beds, the AreoBed toddler bed has to be one of the easiest to inflate available. As the video above shows, inflation is very fast and is effortless thanks to the included pump. The valve on the side of the bed makes deflation and adjusting the firmness very easy as well. Bed can be deflated in as little as 15 seconds. However, for some people this valve has broken or become detached, requiring replacement. The included pump is electric which makes things easy and quick but has drawbacks. First is that you’ll need power to use it. And second, you may need an adapter or even a voltage modulator to use it overseas. Because the AreoBed is made from PVC, the bed is easy to wipe down. The included removable cover is machine washable. The AeroBed Mattress for Kids deflates and folds up into a very small and lightweight package. The cotton cover, mattress and carry bag weigh a little over 1 pound. These could be easily placed anywhere inside a car, in a suitcase or even a carry on bag on a plane. However the AeroBed loses a point in this category because of the pump, which is heavy (at around 8lb), and does not fit in the bag. The weight of the pump could cause issues with weight limits when flying if you’re already carrying a lot. In terms of bulk, even with the pump, the AeroBed remains quite small. Being able to easily adjust the level of inflation means that you can quicklymake the bed as firm or as soft as suits your child. While an inflatable mattress is never as comfortable as a proper mattress, with the cotton cover the AeroBed can be quite comfortable. Officially, the AreoBed Mattress for kids is for children from the ages of three and up. While not large, when fully inflated the mattress supports up to 150lb so if your child is under 50in then they can use the AeroBed without issues. The edges of the mattress are raised 4in from the main sleeping part as a safety barrier, so kids that roll around won’t fall out. This menas that younger children might be fine as well, unless they need to be contained. If you’re not sure if a toddler bed is right for you then check out our toddler travel bed guide. The AeroBed is very strong. Made from tough PVC with heat welding for the seams, it easily copes with a lot of abuse including a lot of jumping on. With the side safety cushions this bed should contain all but the most mobile of sleepers. And being low to the ground means that it is stable. There have been no reports of the bed tipping over at all. The AreoBed Mattress for Kids is 50 x 25 x 10 inches when inflated and weighs 1lb. An electric pump, carry case, and cotton cover are included (total weight is approximately 10lb). Effortless and quick inflation and deflation. Included pump requires a nearby electric outlet, and may not be suitable for all voltages. For some people the inflation/deflation valve has broken off or become damaged. AreoBed can provide replacements, and have a video on the subject which may suggest this happens to a small but significant minority of owners. The AeroBed is a good choice for an inflatable toddler travel bed. Especially if you need a toddler travel bed that is portable and easy to use. It’s key features are the rapid inflation and deflation and great strength (thanks to how they are made). The weight of the electronic pump is a downside, but it remains highly portable. 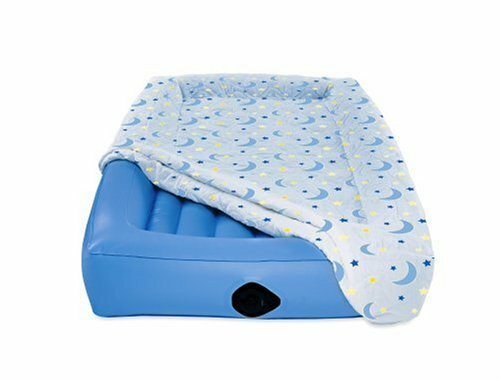 Overall, a quality inflatable toddler travel bed. Still unsure which travel crib to buy? Check out toddler bed buying guide.